With a release date smack in the middle of the biggest gaming season of the year and a name like Fusion: Genesis, there's a slight chance you may have overlooked this Xbox Live Arcade title. Which is a shame, since the project by several former Rare employees (Killer Instinct, Perfect Dark) tries to marry two great aspects that can make genre fans drool: the twin-stick shooter and the formula of the fan-favorite space combat sims of old. Fusion: Genesis is not lacking in ambition then, but perhaps it is a little too ambitious. Space combat is awesome, of course, but there aren't that many games that have successfully pulled off translating what worked great with a keyboard-and-joystick control scheme on the PC to the current consoles and their controllers. 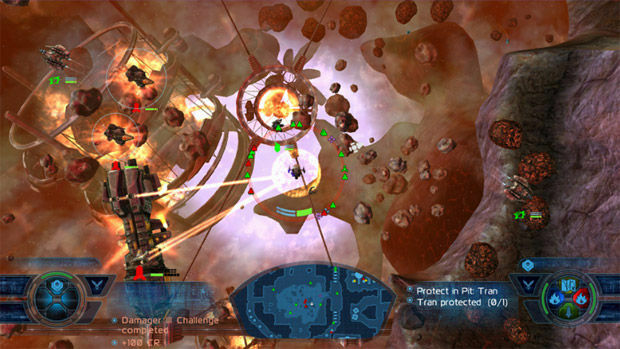 Project Sylpheed was an entertaining enough distraction in a world without Rogue Squadron, but DarkStar One was the first title to really this translation work; the tweaked menus and controls traditionally reserved for the PC made it manageable to play the entire game with just a console controller. 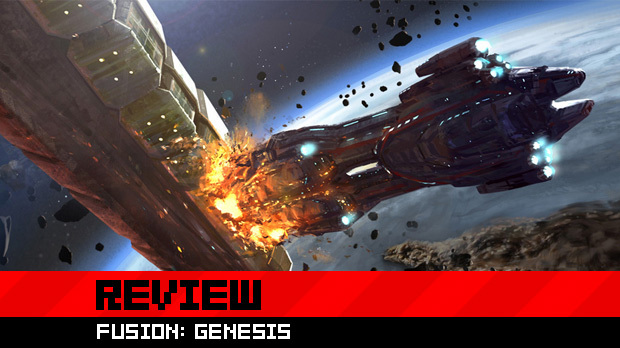 In many ways Fusion: Genesis mirrors many of the interface approaches that made DarkStar One work so well, but fits it into a more arcade-y top-down shooter design. 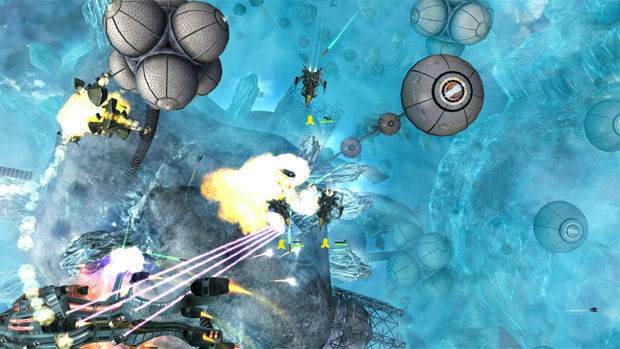 Being a twin-stick shooter at heart, you'll fly around large space levels filled with stations to dock at, asteroids to blast or mine, and enemies to destroy. It looks rather nice with layers of depth that make the 2D approach work without sacrificing the feeling you are flying around in space. For a downloadable title, Fusion: Genesis provides an expansive amount of tools to customize your experience. There are increasingly larger ships to acquire, tons of weapons to buy, skills to level up, and goods to trade. Your ship is supplemented by a Sentient, a small AI companion that shoots at enemies and acts as a sort of "pet" seen in (MMO) role-playing games. These Sentients even come in Tank, Healer, and DPS forms, and leveling them up allows you to tailor them to add more armor, shields, and damage output to your own ship, as well as unlock several skills like taunting an enemy craft to focus its attacks on the Sentient. The game boasts having up to 40 hours to gameplay, which is an amount that isn't inconceivable if you want to buy and collect everything there is. Basically it's what you know and love in a space sim, tinkering and upgrading your spaceship until nothing can stand before you, but with top-down twin-stick gameplay. All the individual elements that should have made a perfect game for the twin-stick and space combat enthusiasts are here. Unfortunately, these separate elements are dragged down by what should have tied it all together nicely: mission design and clearly communicated reasons for progression. The missions in particular are quite odd given how repetitive they are. While the main storyline progresses gradually throughout special missions in the game, it starts in a cool way with a daring escape a tiny craft and slowly sees you moving up to bigger and better ships. You can't simply burn through the storyline, though. You'll need a better and more powerful ship to beat some of the later story missions and you have to level up a bit to unlock new story missions. In order to do so, you have to join one of five different factions to do missions for them, which sadly leads to a lot of grinding. Grinding is a big part of space sims if you want to take the trading approach, but in Fusion: Genesis it becomes unnecessarily boring in all aspects of single-player. Each faction you can join is different enough, ranging from peacekeepers who give you XP for scanning traders, traders who reward you for mining minerals, criminals who tend to get attacked by everyone, and two Human factions that are at each other's throats. However, for all the differences there are between the factions, the gameplay is nearly identical for each of them. 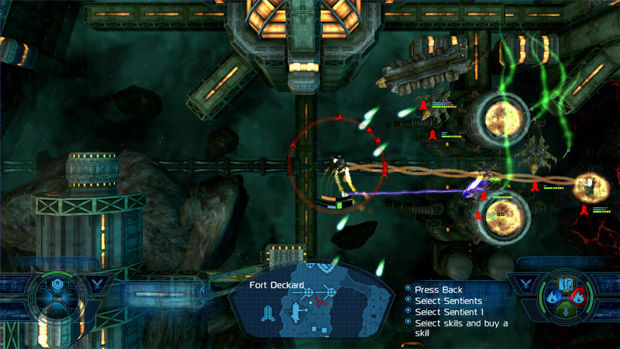 Faction space stations offer three types of single-player quests: a story mission that lets you rank up in the faction, random missions that make you fly across a map to blast or scan things, and special missions that let you pilot different ships to let you enjoy blasting at things with bigger guns than you can currently afford. 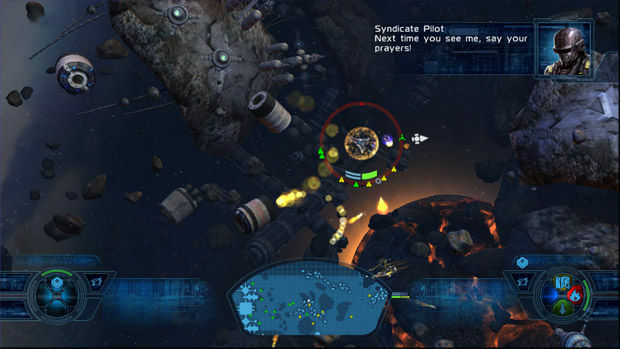 While the gameplay in Fusion: Genesis offers some good fun, these missions end up revolving around the same actions: fly to the opposite side of the map, fly around a bit and shoot enemies, and fly back. Until you manage to upgrade your ship enough to make the flying back and forth part go quickly, it can become a bit of a mindless drag to slowly move your way up through the faction ranks. Fusion: Genesis also suffers from a lack of communication to the player. There are a million things to buy and sell, and many weapons to choose from, but the game never tells you properly how to use different kinds of weapons or why and when you should buy them. Trading doesn't fare much better. There are a ton of goods to buy and sell, but there is no system to help you find out if it's worth buying one type of goods to sell for a profit elsewhere. There's something to be said for letting the player experiment freely, but there's a limit. As a result you end up just going through the motions of the toughest optional faction missions in the expectation that these will yield the largest reward in the shortest amount of time, and while it is still fun to fly around in space and shoot at things around you, it quickly becomes a job rather than a fun and interesting adventure. To the game's credit, it offers are plenty of interesting concepts for those who delve into it. A persistent online world means you can encounter players of different factions throughout the game, two of which hunted me down when I was working for the criminal Syndicate faction and ended up spawncamping outside my base with no way to escape or change my faction. (Damn you xXSouljaboyXx!) The best way to describe the online experience is "random." Seeing players warp in and fight it out breathes life into the game's world, and there are options to form online squads to go out hunting and questing with your friends. A couple of semi-separate online modes provide some extra entertainment that goes beyond the single-player campaign. 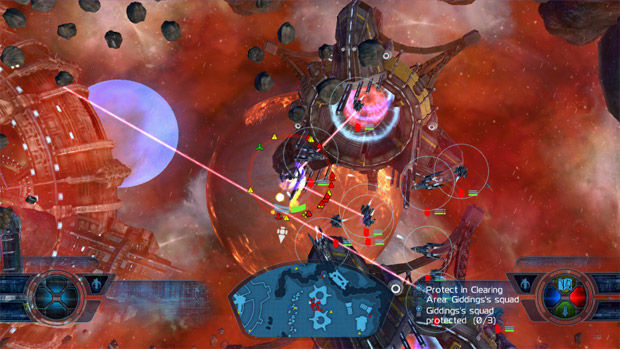 Dark Legion Invasion lets you and other players participate in a station defense mission, repairing turrets, fighting off hordes, and buying defensive support. Military Warzone is only available if you chose one of the two warring Human factions, and it's a sort of team deathmatch in space where the goal is to destroy the opposing team's carrier. Finally, The Ark is somewhat of a traditional PvE raid dungeon. All of these are easy to hop into with other players, fun to play together, and each mode gives you reward points that can be traded in for superior firepower. It's these online modes that show you just how much there is to unlock and progress beyond the single-player missions, but sadly that the feeling of delivering shock and awe at the hands of a massive battleship is hard to find elsewhere in the game. It seems most of the effort in Fusion: Genesis has gone into making different elements work on their own and making them cool, instead of focusing on tying everything together. The ambitious project to turn all these aspects into a tight and coherent experience results in a nearly incomprehensible game for any novice player, but at the same time space sim veterans who are interested in a twin-stick approach might enjoy the sheer level of freedom -- as long as they don't expect it to be a top-down Freelancer or Elite. Despite the lack of mission variety and the game's insistence on never explaining much whatsoever, there's still something intangibly addictive about grinding your way to a massive ship with beam weapons and missiles, as long as you don't do it more than an hour at a time lest the repetition hits you. Unfortunately, the moment you start working for another faction you lose access to that giant ship you were finally able to buy after completing all of one faction's story missions and you'll have to start from scratch if you want to go through all factions' stories. Fusion: Genesis is like a house made of different colored and shaped bricks, but no mortar. It's fun to play with the individual elements yet it all feels a bit unstable as a whole. Still, if you are a big fan of twin-stick shooters and space sims, and if you can overlook its faults while playing it casually, you can still get plenty of hours worth of enjoyment out of it.